In July 1998, small hive beetles were first identified in South Carolina. The beetles were collected from a weak honey bee colony in Charleston County. The small hive beetle has also been discovered in Florida and Georgia in May and June 1998, respectively. Prior to these discoveries, the beetle had not been reported to infest beehives except in tropical and sub-tropical regions of South Africa where it is considered to be a secondary hive pest. 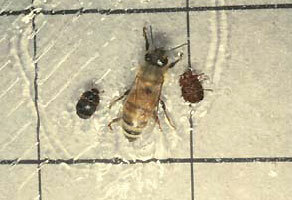 Worker Honey bee and adult small hive beetle. The small hive beetle has been confirmed in 16 South Carolina counties including Bamberg, Barnwell, Berkeley, Beaufort, Charleston, Colleton, Dorchester, Florence, Hampton, Jasper, Lexington, Oconee, Orangeburg, Pickens, Sumter and Richland. The discovery of the beetle over such a large area indicates the beetle has been present in our state for several years. The initial point of entry of this pest into our state is unknown, however recent investigations of unidentified beetle specimens that were submitted in November 1996 have yielded positive identification of the small hive beetle. 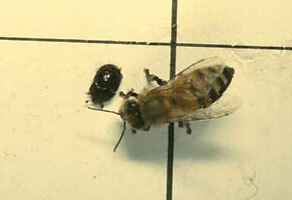 The sample of beetles were collected from a managed honey bee colony in Charleston County. Another unidentified sample of the small hive beetle was submitted from Berkeley county in 1997. These earlier beetle samples were identified to family name only because no means of identifying the pest to genus and species were available at that time and no one suspected the small hive beetle to be found in North America. The small hive beetle is not considered a serious problem in South Africa where the pest only damages weak bee colonies and stored comb. Apis mellifera scutellata, the African honey bee, apparently does a better job of controlling this pest than our European honey bees. Improved hygienic behavior by the Africanized honey bee and the habit of quickly absconding under light predation likely play a major role in keeping the beetles in check in South Africa. The adult beetles have 6 legs and 2 pair of wings, are reddish brown to black in color, and are about 5-7 mm (about ¼ inch) long. The dorsal side or back of the beetle has very fine hairs which cause the fast moving insect to be very slippery and difficult to grasp and remove from the colony. The exterior of the adult beetle is very hard and protects the beetle from bee stings and other dangers. Adult beetles fly readily, but their flight range is unknown. Small hive beetle eggs are pearly white and look much like honey bee eggs, but they are slightly smaller. Eggs are expected to be laid throughout the year in South Carolina except during the colder months of December - March. Larvae are cream colored and when fully grown are about 11 mm (7/16 inch) long and slightly more than 1.6 mm (1/16 inch) in diameter. The larvae look much like young wax moth larvae, but never reach the size of mature wax moth larvae. Small hive beetles and wax moths can infest the same honey bee colony. The small hive beetle larvae have only 3 pair of prolegs which are located near the head, whereas the wax moth larvae have many small, uniform pairs of legs along the body. Beetle larvae do not spin a cocoon as do wax moth larvae. Beetle larvae have tough exterior bodies; wax moth larvae have soft exterior bodies that can be penetrated easily. Small hive beetle larvae on comb..
Pupae are light tan to blueish tan in color and are approximately the same size as the adult beetle. The mature pupae have the same appendages as the adult beetle, but are undeveloped. Life Cycle: Female adult beetles prefer to deposit irregular masses of eggs in crevices or cavities inside the hive, although eggs are often found in comb not defended by bees. Studies in South Africa indicate that eggs hatch in 2-3 days. The females are thought to have a great reproductive capacity and a few fertile females can result in a heavy infestation in a single generation. Beetle larvae mature from egg hatch to pupae in 10-16 days. Larvae require a diet of honey and pollen to develop fully. The mature larvae leave the hive and burrow into the soil beneath the hive to pupate. The length of the pupal stage varies, but most pupae emerge from the soil as adults in 3-4 weeks. Newly emerged adults are very active and fly readily when disturbed; the newly emerged adults reenter a bee colony and begin the life cycle again. Female beetles begin laying eggs about one week following their emergence from the soil. As the adults age, they seek refuge and seldom fly. The adults normally gather at the rear of the hive on the hive floor where they feed on pollen that falls from the brood area above. Adult beetles are often seen in the top of the hive as the beekeeper removes the inner cover. Adults live up to 6 months, therefore more than one generation may live in the same bee colony. Five beetle generations per calendar year are possible in South Africa. The South Carolina beekeeping industry faces another threat, the small hive beetle, in addition to the tracheal and varroa mites that have been a major problem over the past 10 years. Early reports of damage caused by this beetle in the US indicate that the small hive beetle may be a more virulent pest than in South Africa where it is known only as a secondary hive problem. Reports indicate that when bee colonies do not readily eject the beetles from the hive, strong as well as weak colonies may be equally affected. Small hive beetle adults and larvae cause much damage inside the hive. Feeding larvae consume pollen and honey and heavily damage wax comb, especially newly drawn comb. Old sturdy comb can better withstand heavy larval feeding. Honey leaks from the damaged comb and is normally spoiled from beetle waste, producing a frothy mess; the resulting fermented honey is useless to the bees which may abandon the affected equipment and sometimes abscond. Beetle larvae also feed on stored comb and supers of honey in honey houses, especially frames containing pollen. The beetle is a major problem when honey supers are allowed to remain in the honey house for long periods prior to extraction. Wax cappings set aside following honey extraction may become beetle infested, also. Bee brood rearing stops when the beetle infestation reaches high levels in a colony and reports indicate that the colony will not be able to overcome the problem. Beekeeping management costs in South Carolina will increase due to the negative effects caused by the small hive beetle. Extra costs include: 1) time and labor to detect and treat for the beetles; 2) treatment materials; 3) colony replacement from beetle losses; 4) damaged equipment replacement; 5) loss in honey production and pollination from affected colonies; 6) income loss from pollination rentals and honey sales. Maintaining healthy bee colonies that are capable of protecting all comb in the hive is desirable in preventing small hive beetle problems. Mite control and disease prevention along with keeping a young laying queen are important. Removing excess supers of unprotected honey and empty comb from the hive is highly recommended. Beekeepers should avoid leaving filled honey supers standing in the honey house for more than a day or so. Stacking lightly infested beetle supers on strong bee colonies for clean up as for wax moth control should not be practiced. This only spreads the beetles and may result in loss of additional colonies. Purchasing colonies, packages, and nucs from reliable sources that have been certified beetle free is highly recommended. The beekeeper should make a thorough inspection of colonies prior to making splits or exchanging brood frames between colonies to prevent spreading the beetles. Young colonies are particularly vulnerable to beetle problems, so every attempt should be made to maintain healthy colony conditions. Beekeepers should inspect their colonies for signs of small hive beetle infestations. Adult beetles run across comb seeking refuge when the hive is first opened. Beetle adults are often discovered underneath the hive top and cover or at the rear area of the bottom board. In a heavily infested colony, beetle adults and larvae or grubs are found seeking shelter under comb debris on the bottom board. 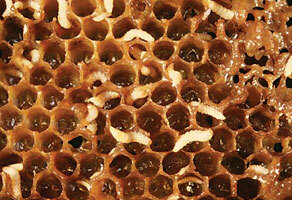 Beetle larvae can also be found in comb cells and in the soil beneath the hive along with pupae. Beekeepers should suspect small hive beetle activity when fermented honey runs out the hive entrance or pools on the honey house floor. A “decaying orange” odor is often given off by the spoiled honey. A colony heavily infested with beetles may result in many worker bees massing at the hive entrance as they abandon beetle infested areas of the colony. Another symptom of a heavily infested colony includes the appearance of wet or greasy bees and frames. Night detection of small hive beetles on hive frames is possible when amber light is directed inside the colony. Varroa mite sticky boards have proven ineffective in beetle detection as the adult beetles move easily across the sticky material. Even a heavy coating of a much stickier insect trapping material such as Tangle Foot® has proven to be ineffective in stopping adult beetles. Small card board inserts with one side of the card board surface removed have been successful in beetle surveys. The insert should be placed at the rear of the hive on the bottom board where adults normally gather. The adult beetles are apparently attracted to the insert and seek shelter in the corrugations. “Preventive” soil treatments for this pest are not recommended especially in areas free of the beetle. If small hive beetles are suspected in counties outside known infested areas, the beekeeper should place a few of the beetles, adults or larvae, in a small bottle of alcohol and deliver the specimens to the local Clemson University Cooperative Extension Office for Problem Clinic processing. Or, the beekeeper may forward specimens to Department of Plant Industry apiary inspector Fred Singleton, 204-B North Gum Street, Summerville, SC. 29483, Phone: (843) 821-3234, Email: fsngltn@clemson.edu. Once a beekeeper detects the small hive beetle, he/she should manage all colonies with diligence to prevent stressful conditions that might enhance beetle activity. Check Mite +®, formerly named Bayer Bee Strip, is registered in SC as an inside - hive treatment for small hive beetle control. Colony treatment with this product must be applied at a time when bees are not producing a surplus honey crop. Remove honey supers before application of Check Mite + strips and do not replace until 14 days after the strips are removed. The production and sale of comb honey is prohibited in colonies treated with this product. Follow label directions for all pesticides. Use this product only when outside temperature is 70°F (21°C) or greater. A control measure for dead colonies includes freezing the hive and its contents at 10°F (-12°C) for 24 hours. This will kill all life stages of the beetle. Equipment should be checked for beetle activity upon removal from the freezer especially in hot weather when longer periods of freeze time are sometimes necessary. Honey bees will not normally accept supers that are contaminated with beetle fermented honey. The fermented honey can be washed off with a garden hose and bees will normally rework the equipment. A vulnerable point of the beetles’ life cycle is when mature larvae enter the soil underneath the hive to pupate. Gard Star® is registered as a soil drench pesticide to control small hive beetles. Direct pesticide bee contact or indirect chemical fumes may cause massive bee kills, therefore placement of colonies on hive stands are highly recommended. Beekeepers should read the product label carefully and follow all directions. their potential negative impacts to the bees can be minimized by making soil pesticide applications just before dusk to avoid peak bee flight activity and to allow the pesticide to dry before next day. On the other hand, natural insect predators such the imported fire ant, which is now found in every South Carolina county, may feed on beetle pupae in the soil. High density fire ant mounds of 100 mounds per acre (250 mounds per hectare) may be required for effective control, however the predation level may be dependent on the availability of other food sources on the site. Hive equipment that is heavily infested with beetles may be placed over a large fire ant mound for cleanup. Beekeepers should not experiment with illegal pesticide treatments for beetle control. The beekeeping industry must rely on bee scientists who make investigations under controlled conditions. Remember that most materials that will kill the small hive beetle will also kill honey bees or worse may injure the beekeeper and contaminate honey and the equipment. Caron, D.M. 1997. Other insects. In Honey bee pests, predators and disease. 3d ed (R.A. Morse & K. Flottum eds.) A.I. Root Co., Medina, Ohio. Delaplane, K.S. 1998. The small hive beetle, Aethina tumida - A new beekeeping pest. Bugwood 98. University of Georgia. Fore, T.H. 1998. Destructive beetles found in Florida hives. The Speedy Bee. Vol 27:5, pp 1, 6-8. Fore, T.H. 1998. Hive beetles still limited, officially, to three states. The Speedy Bee. Vol 27:7, p. 2. Lundie, A.E. 1940. The small hive beetle Aethina tumida. South Africa Department of Agriculture & Forestry Entomological Series 3, Science Bulletin 220. McCaskill, V.H. 1998. Personal communications. Sanford, M.T. 1998. Aethina tumida: a new beehive pest in the western hemisphere. Apis 16(7), University of Florida. Sanford, M.T. 1998. Update on the small hive beetle. Apis 16(8), University of Florida. Singleton, F.D. 1998. Personal communications. This information is supplied with the understanding that no discrimination is intended and no endorsement by the Clemson University Cooperative Extension Service is implied. Brand names of pesticides are given as a convenience and are neither an endorsement nor guarantee of the product nor a suggestion that similar products are not effective. Use pesticides only according to the directions on the label. Follow all directions, precautions and restrictions that are listed. EIIS/AP-2 (Revised 01/2000).